Make sure Phyllo dough is defrosted and ready, but keep it covered so it doesn't dry out. Add zucchini, carrots, onion and garlic to food processor; shred. Transfer zucchini mixture to medium sized bowl. Melt butter and pour over zucchini mixture. Add shredded vegan cheese and stir everything until combined. Add in salt, pepper and herbs and mix thoroughly. Spray mini muffin tins with non-stick cooking spray. Lay Phyllo dough sheets carefully out onto waxed or parchment paper. Cut into 5" X 5" squares. Quickly and carefully brush each sheet of Phyllo dough with melted butter and press into muffin tin cups. Fill cups with zucchini mixture to top and gently fold over extra dough. Savory and satisfying, these mini zucchini pastry cups will make people think you've spent all day in the kitchen, yet they're a breeze to put together. 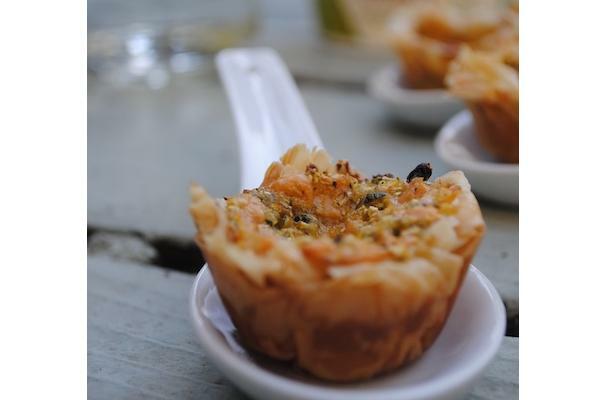 Loaded with zucchini and carrots, you won't be left feeling guilty if you over-indulge on these cute little appetizers!